I was catching up on my Google Reader, when I noticed that fabulous Shawnta of Peace, Love, and Namaste had added the Self-Stitched-September '11 button to her side bar. It was just this time last year when I started getting serious about sewing...or at least serious about thinking about sewing. That's when I realized... I've made very few practical garments in the past year. Sure, that Macaroon made of quilting cotton is adorable, but it's mighty close to showing off my business when I sit down. Not appropriate. And my Green Goddess Dress is divine on a hot Louisiana evening, but a little too curve hugging for the office. If I'm going to survive Self-Stitched-September, now a year old dream, I'm going to need some work clothes. And so, a Wednesday night became Suddenly Sorbetto. Of all the Sorbettos I've seen out there on the interweb - and there are quite a few because the pattern for this little number is FREE - I have never, NEVER, seen one that couldn't been worn to the office. Provided pairing with a pencil skirt or slacks. With Mena flouting her 45 minute Sorbetto completion average on her Seven Days of Sorbetto series, I figured I could cerntainly make this bad boy in no time, provided I had some usable fabric in my stash. I found some left over swiss dot from my Sweet Swiss Dot Dress, and Gus was at poker, so at 7pm I told myself I would finish this Sorbetto TONIGHT. Here is what my sewing table looked like mid-Sorbetto. For work, I thought it best to add a sleeve to the blouse. I downloaded Mena's sleeve pattern from The Sew Weekly... unfortunately I don't think it came out to scale. It appeared to be a sleeve for a small child... so I used the Macaroon sleeve to estimate my size (I eliminated the curved edge of the sleeve because I wanted to finish it with bias tape.) You can easily scale up Mena's sleeve, or use a sleeve from any other pattern you have around. 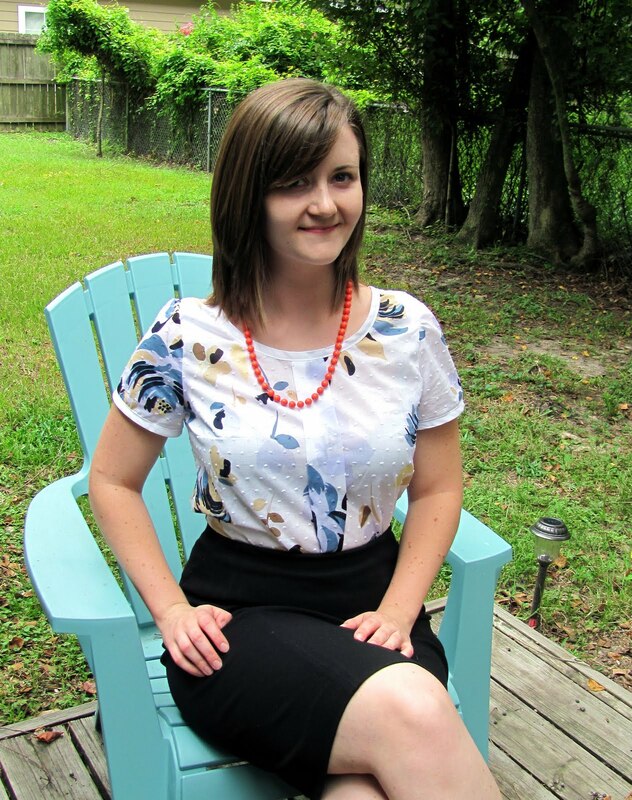 With a black pencil skirt, this blouse is 100% work appropriate! And kind of cute too. For my next Sorbetto (and yes, there WILL be a next Sorbetto) I plan to extend the length to make it easier to tuck in. The whole thing took about 3 hours - including a trip to Hobby Lobby to get white bias tape! Self-Stitched-September '11 here I come! Living the dream, folks. Is your wardrobe ready for a full month of self-made attire? If not, what's missing? I could have swore I commented on this post before but oh well.... that top is so cute!!!! You have motivated me to finally commit the the Sorbetto bandwagon and I have printed out the pattern. Haven't decided if I will do sleeves though. I'm glad to have more company in the SSS11!!! I'm busy trying to get some more separates together as I think that will be my ticket to success with the challenge. I am frantically trying to finish bits and bobs for SSS11! But there is loads missing! I think I should definitely try and get through my UFO pile! Love the Sorbetto! I have a couple of smaller fabrics i'm thinking of using for some! This Sorbetto is lovely, and definitely work appropriate! I signed up for SS'11 with a twist: I won’t include work clothes because I wear a suit to work everyday, and like you, I have made very few work appropriate clothes. However since signing up, I have made a Sencha and a Pendrell, both of which are work appropriate, and perhaps I should also whip up a new Sorbetto, this time with three quarter sleeves. I look forward to seeing your daily outfits during September! @Shawnta Can't wait to share this SSS! @Stevie The Sorbetto is great for small pieces of fabric - the pattern says 1.5 yards but I did it with less than a yard. It's all about creative folding! @Andrea Thanks! Very wise twist - especially for suit heavy work environments. Luckily I'm on vacation for a week in September, so that will help. what a cute sorbetto! 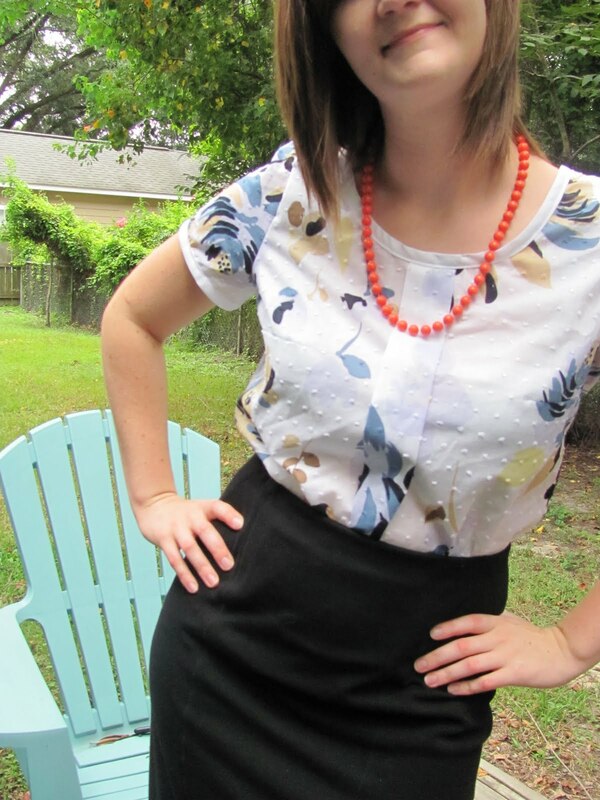 I've seen dozens of versions made up, but you pairing it with a pencil skirt really makes me want to sew a couple for work outfits!